Pick you up from your cruise terminal by your private English-speaking guide, drive to Suzhou, famous for the classic China gardens. In Suzhou, we will visit two of its resentative gardens-the Humble Adminsitrators Garden and the Master of the Nets Garden. 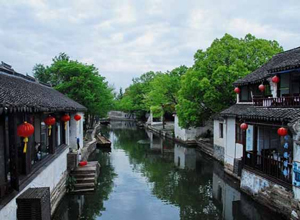 After lunch, drive to the water village of Zhouzhuang. Along the banks of its central canal sit old plaster dwellings, surrounded by fine stone bridges and lush weeping willows. A pleasant boat ride on the canals is included. Have a city sightseeing of the main attractions downtown. Visit the Shanghai Urban Planning Exhibition Center, far more interesting than its name suggests, it shows the city’s past, now and furture in different techonology skills. Then we will visit Yu Garden, one of the best Suzhou style gardens in southern China. Ascend the Shanghai World Financial Center to have a panorama of Shanghai. Finally, stroll along the famous waterfront-the Bund and the renowned commercial street-Nanjing Road. After the tour, be escorted back to your cruise port.